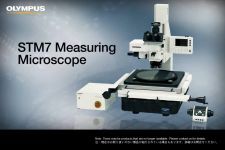 Whether samples are small or large, simple or complex, or measurements are being taken by a novice or an expert, the Olympus STM7 range features measuring microscopes tailored to fit your needs. The STM7 series uses the same UIS2 infinity-corrected optical system found in state-of-the-art optical microscopes. As a result, observed images have high resolution and high contrast, with aberration thoroughly eliminated to help ensure highly accurate measurement in minute detail. To further improve measurement accuracy, the STM7 series uses a highly durable, vibration-resistant frame with a granite surface plate. This stability enables sub-micron level measurements with minimal error. As modern manufacturing technology becomes increasingly miniaturized and precise, highly accurate measurements are even more essential—not only along the XY axis, but also along the Z-axis. Olympus responded by creating the first reflective active, confocal autofocus system. Calibration certificate issued by Olympus Corporation Test & Analysis Center, and authenticated by ILAC-MRA calibration accreditation agencies (JCSS, JAB). Traceability systems vary depending on periods and countries/regions. The samples used in STM7 calibrations are calibrated in each country/region. Please ask Olympus for details. The accuracy of Olympus’ measuring microscopes is controlled by a strict traceability system, and Olympus even offers traceable calibration at the time of installation. Five STM7 suggested configurations provide you with flexibility to choose the features that you need. The STM7 features a 300 mm x 300 mm stage capable of measuring large samples, including 300 mm wafers and printed circuit boards. Three stages are available, each with a different measurement stroke - 100 mm x 100 mm, 200 mm x 200 mm, and 300 mm x 300 mm. Whether your samples are large or small, we offer a stage that fits your application. The objectives’ very long working distance helps you be confident when focusing on samples with large peaks and troughs and minimizes the chance that the objective comes in contact with the sample. Furthermore, their low-magnification capability enables wide areas to be observed in a single view. Metallurgical objectives enable high-magnification, high resolution observation comparable to that of optical microscopes. What’s more, these objectives can be used for brightfield, darkfield, and DIC observation. With the STM7 series, a single controller makes it possible to perform virtually all measuring microscope operations, including use of readout reset, illumination control, focusing, and autofocus. For efficiency and convenience, the unit can be placed wherever you wish and operated easily with one hand. The power supply and transmission for each unit are combined in a single control box. This maximizes the workspace even when a range of optional functions, such as the focus navigator, are added. Manual and motorized focus control options are available. Choose the model that addresses your needs in terms of samples and measurement content, regardless of stage size - all frames incorporate a linear scale for the Z-axis that enables 3-axis measurement. Manual models offer excellent cost performance with familiar handle operation that enables rapid vertical movement for users who measure samples with a variety of heights. The motorized unit improves operability and reduces handling fatigued caused by making repeated focus and height measurements. The coaxial knobs for coarse and fi ne movement offer a feeling similar to manual operation, while the models can also be equipped with an autofocus unit. The STM7 series displays light intensity using quantitative digital display, enabling observations to be made under consistent illumination conditions. The light intensity manager can be used with the coded revolving nosepiece configuration. The coded revolving nosepiece automatically detects when you change objectives. This allows the illumination method and light intensity to be registered for each objective and adjusted automatically during measurements when the objective is switched. Now, there is no need to manually adjust light intensity, which used to be required with every switch between magnifications. The indicator displays the device status and settings. The minimum X-, Y-, and Z-axis values can be switched between 0.1 μm and 1 μm, and the display units can be switched between mm, μm, inches and mil. Whether attached to the frame or a desk, the placement of the detachable digital readout is up to the individual user. While standing to take measurements, it can be placed on the side of the frame at almost the same height as the site of observation for easy viewing. When operating from a sitting position, such as observation or measurements on a monitor using a digital camera or when using the motorized Z-axis focusing model, simply place the digital readout and hand controller on the desk. Olympus’ focus navigator delivers highly reproducible height measurement by projecting a pattern within the field of view and identifying vertical deviations. Slight errors can occur in height measurements taken with normal visual observation, even when focus appears to be sharp. The focus navigator, however, enables measurements to be made simply by matching up the marks, reducing operator subjectivity in measurement results. The STM7 autofocus unit allows highly accurate height measurements to be made with minimal time, regardless of the level of operator experience. Use of the reflective active, confocal method provides a stable focal point independent of surface roughness or a slanting sample surface, while the small laser diameter enables the use of autofocus, even on minute objects, such as bonding wires. Instantaneously takes autofocus from roughly focused to sharply focused at the center of the field of view. The TRACK Mode provides autofocus that tracks the peaks and troughs of the sample, even if the stage is moved, keeping the image continually in focus. This advancement greatly improves the efficiency of Z-axis measurements by enabling observations to be made without taking your hands off the X and Y handles. The ability to clearly and easily see the output display component of measuring microscopes is essential. Olympus measurement software deliver complex measurements with greater accuracy. The software also enables the use of digital cameras. Combining a coded revolving nosepiece with a digital camera lets you display the objective magnification on-screen during observation and allows you to record that magnification. This convenient feature allows information on your sample and the objective’s magnification to be recorded at the same time when recording a sample. *1 When using the large frame STM7-LF/STM7-LFA, a specimen whose height is 100 mm or less can be placed at the position backward from the light axis by 180 mm or more. * Microsoft Office 2010/2013/2016 (32 bit) are also supported.